With “South Of Heaven” Slayer made its foray into more melodic and midpaced territory. After the clusterbomb that was “Reign In Blood” it was wise of the band to slow down and once again pen more elaborate material. Having pushed the speed/thrash metal genre in terms of speed and overall intensity “South Of Heaven” sounds more controlled and distills the band’s sound into a crunchy whole. This comes at the price of being less confrontational and the integration of a less savage vocal style. Produced with Rick Rubin at Hit City West in Los Angeles “South Of Heaven” was the last album to feature Araya’s falsetto and the first to have Araya play bass guitar with a pick instead of his previous finger picked style. This album marks the beginning of Slayer’s second era, and it is the one but last recording to feature original drummer Dave Lombardo. As history would note Kerry King (lead guitars) was going through a dry spell in terms of creativity due to his then-recent marriage and moving to Phoenix, Arizona. Thus Jeff Hanneman leads the charge with King only contributing to three songs. Contrary to King the writing style of Hanneman is more involved and compositionally more ambitious. There is a greater focus on leads/solos, and in architecture and composition this record is closer related to “Hell Awaits” than to its more urgent sounding direct predecessor. This is perhaps not all that surprising since “Hell Awaits” was also written in its majority by the technically more refined guitarist Jeff Hanneman, with King contributing to three tracks and having sole writing credit for the truly vicious ‘Praise Of Death’. As it stands Hanneman is responsible for the classics. For all albums up to this point Hanneman wrote the lion’s share of the material, with the exception of “Reign In Blood” which was written almost in its entirety by Kerry King resulting a more straightforward experience. In contrast to the preceding records Slayer opens with the title track, and much like “Hell Awaits” it has an extended, nearly minute-long opening. ‘South Of Heaven’ is a moderately paced piece that slowly builds towards its climax. Despite the slower overall pace the band manage to sound incredibly evil, and the goofy satanic lyrics are actually full of powerful imagery. Even though the tempo is still high, it is much slower than on the previous records. 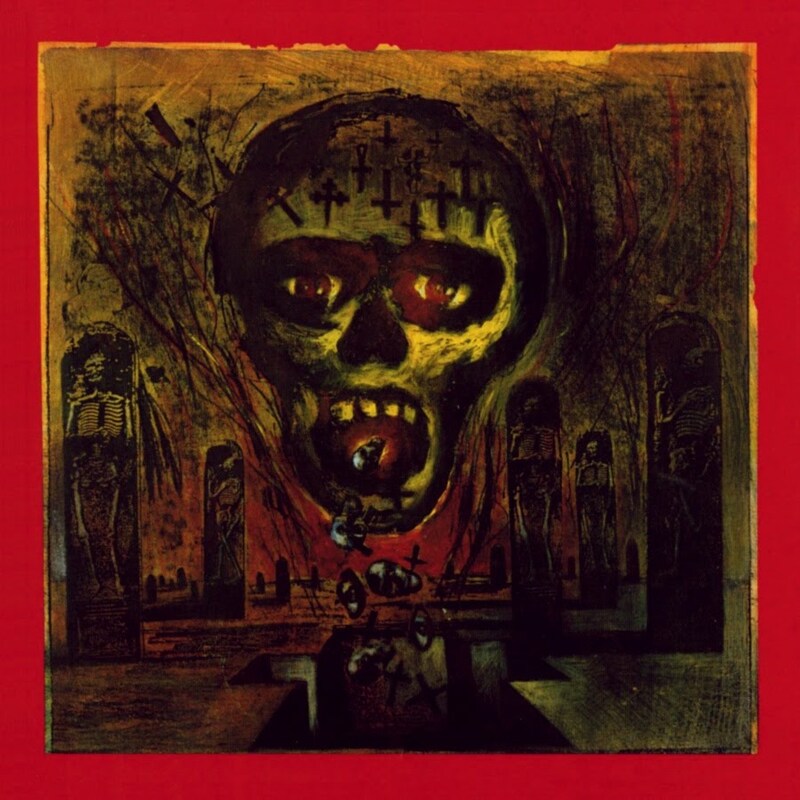 Overall “South Of Heaven” is faster than “Hell Awaits” but this is mainly due to the leaner riff construction and Lombardo’s breakneck drumming. Araya’s vocals are much more subdued, and not nearly as unhinged as on prior records. ‘Live Undead’ stands out in the sense that it feels like a “Show No Mercy” b-side that was rewritten to fit the band’s current, much slower interpretation of its sound. ‘Behind the Crooked Cross’ sounds like Slayer trying to one-up Metallica’s thematically similar ‘Leper Messiah’. ‘Mandatory Suicide’, a protest song against war, is one of the album highlights, along with the title track – and both have become perennial live staples in the band’s setlist. For good reason, both are the strongest cuts the band has ever penned. The change in style is further emphasized by moving the lyrics into more socio-political territory dealing with warfare, organized religion and serial murder instead of the band’s previous subjects of horror, and goofy Satanism. ‘Silent Scream’ is a pro-abortion song, ‘Behind the Crooked Cross’ and ‘Read Between the Lies’ deal with the ills of organized religion, while ‘Ghosts Of War’ and ‘Mandatory Suicide’ describe the horrors of war and the general absurdity of the situation. ‘Live Undead’, ‘Cleanse the Soul’ and ‘Spill the Blood’ are more of the usual Slayer horror fare, and ‘South Of Heaven’ combines religion and horror in what, arguably, is the best Slayer track up to that point. Tom Araya’s falsetto appears for the last time in ‘Live Undead’ and he takes songwriting credits for the lyrics to ‘South Of Heaven’, ‘Silent Scream’ and ‘Ghosts Of War’ while contributing material to a further three tracks. “South Of Heaven” is a team effort on part of Hanneman and Araya, with the latter making his presence felt in the vocal slot. “South Of Heaven” is the first to include spoken vocals, appearing first in ‘Mandatory Suicide’. The second half of the album is notably weaker than the opening half. ‘Read Between the Lines’ and ‘Cleanse the Soul’ are two straightforward cuts reminiscent of “Reign In Blood”, but not nearly as convincing. Of the two ‘Cleanse the Soul’ is the superior. The Judas Priest cover of ‘Dissident Aggressor’ is a nice touch since Slayer has always been very inspired by these famous Brits. The album ends on a lownote with ‘Spill the Blood’ as, unlike in the past, the song never reaches the adrenaline-fueled high marks of prior records. 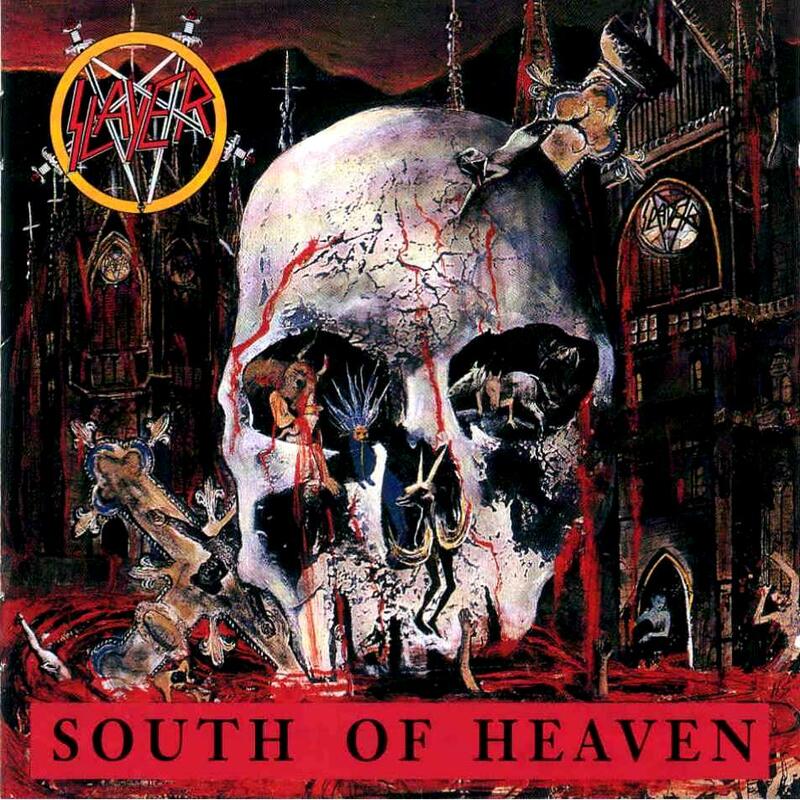 In all “South Of Heaven” is departure on several fronts for Slayer. Gone is the constant high tempo, and much of the corny satanic lyrics have been exchanged for more realistic subjects. Despite all that the dueling solos of Hanneman and King are still intact, and they form the meat-and-bones of this record. The follow-up record “Seasons In the Abyss” would do this new sound more justice, as the band had eased into its creative paradigm. As it stands “South Of Heaven” is nice change of pace for US thrashers Slayer.